The “aggravated felony” is an oft-overlooked legal distinction that provides the basis for the removal of thousands of immigrants each year. This category’s broad expansion and definitive results draw from a punitive turn in crime, drug, and immigration policy, which occurred in the 1980s and 1990s. The concept of “moral panic” is a useful tool for those who seek to understand the development of punitive responses to perceived social problems. 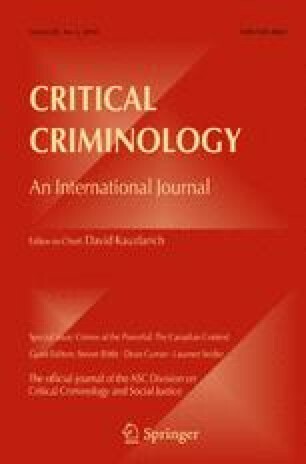 This article revisits the original formulations of moral panic theory in order to highlight the importance of societal context in determining the symbolic salience and punitive outcomes of moral panics. The goal of the article is to evaluate the thesis that a moral panic about immigrant criminality played an important role in the development of the aggravated felony category. This paper was written with the support of the Behavioral Science Training in Drug Abuse Research Fellowship at Rory Myers College of Nursing, New York University; the David Garth Dissertation Award in Public Policy at the Graduate Center, CUNY; and the Pollis Dissertation Fellowship at the Graduate Center, CUNY. I would also like to acknowledge my advisors David Brotherton, Philip Kretsedemas, Jayne Mooney, Leslie Paik, and Monica Varsanyi, as well as the invaluable insight of my greatly missed teacher and mentor, the late Jock Young. Aja, A., & Marchevsky, A. (2017). How immigrants became criminals. Boston Review, March 17. http://bostonreview.net/politics/alan-aja-alejandra-marchevsky-how-immigrants-became-criminals. Accessed July 17, 2017. Lee, M. Y. H. (2015). Donald Trump’s false comments connecting Mexican immigrants and crime. The Washington Post, July 8. https://www.washingtonpost.com/news/fact-checker/wp/2015/07/08/donald-trumps-false-comments-connecting-mexican-immigrants-and-crime/?utm_term=.d49951b8fc76. Accessed July 15, 2017. Lind, D. (2016). The disastrous, forgotten 1996 law that created today’s immigration problem. Vox, April 28. https://www.vox.com/2016/4/28/11515132/iirira-clinton-immigration. Accessed February 27, 2019. Rodriguez, M. (2013). Interview with Ira Kurzban. International Migration Trends and Perspectives-Magazine on Migration Issues, Spring. http://trendsandperspectives.com/pdf/E-InteRod.pdf. Accessed July 7, 2017. Southern Poverty Law Center. (2018). Federation for American immigration reform. https://www.splcenter.org/fighting-hate/extremist-files/group/federation-american-immigration-reform. Accessed October 10, 2018. Swearingen, J. (1988.) States news service. April 14. (https://advance-lexis.com.ezproxy.gc.cuny.edu/api/document?collection=news&id=urn:contentItem:3SJ5-5380-001T-F3X4-00000-00&context=1516831. Accessed October 10, 2018. Thompson, G., & Cohen, S. (2014). More deportations follow minor crimes, records show. The New York Times, April 6. https://www.nytimes.com/2014/04/07/us/more-deportations-follow-minor-crimes-data-shows.html. Accessed July 5, 2017. TRAC Immigration. (2006). How often is the aggravated Felony Statute Used? TRAC, Syracuse University. http://trac.syr.edu/immigration/reports/158/. Accessed July 15, 2017. TRAC Immigration. (2016). U.S. deportation proceedings in immigration courts. TRAC, Syracuse University. http://trac.syr.edu/phptools/immigration/charges/deport_filing_charge.php. Accessed July 15, 2017.